This small house, constructed of red brick, dates from the mid-18th century. At that time, it served as the village 'lock-up'; prisoners were detained under the stairs. 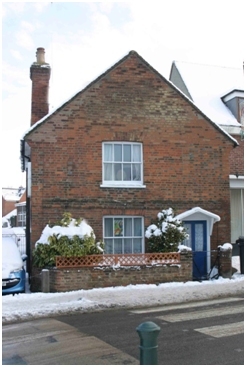 In the mid-19th century it was home to George Knight, the village policeman. In 1855, the local newspaper 'The Herts Advertiser', wrote "under the operation of policeman Knight our village prodigalities have been to a great degree suppressed and if a strict watch is kept on all public houses it will effectively avert the open crime and immorality which was formerly notorious and revolting to the peaceable and well conducted inhabitants". Amelia Nash of the Red Lion was fined £3 12s 6d for refusing to admit Knight to check that there were no customers in the house at 10.30pm. She had already been convicted of selling beer during prohibited hours. In the 1940s, Mr Wren the wheelwright lived here, next door to his premises where Jessamine Garage now stands, ie a business that is still concerned with the transport needs of the village.